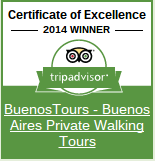 Browse: BuenosTours › Buenos Aires Tours › Why Us? Don’t try to see the city sights with your nose stuck in an outdated guidebook or map – you’ll miss all the interesting stuff going on around you! Have one of our Buenos Aires experts personally show you around and make sightseeing a worry-free pleasure, rather than a chore. 2. Private & personal tours – just for YOU! Do you really want to waste your vacation time stuck on a crowded bus tour? Or trying to follow a stressed tour leader’s umbrella or clipboard among a throng of noisy tourists? Thought not, so come and have a personal tour experience with one of our friendly private guides instead. You’ll be met at your accommodation by your guide and get to walk the city at your own pace. You can ask all the questions you want and have the tour slanted to your interests. It is YOUR TOUR, after all. Riding around in tour buses/cars not only marks you out as a tourist, but also acts as a physical barrier to exploring the look and feel of each neighborhood up close. Fully experience the sights and sounds of Buenos Aires on our private walking tours – going as fast or as slow as you like, in a completely flat city that’s criss-crossed with local buses, subway lines, and taxis, to link up areas if needed. There’s no excuse not to sightsee on foot. Sick of “bilingual” foreign tour guides whose English you barely understand? And what about the boring scripts they read from (often in 3 different languages that you have to wait through), full of meaningless facts, names and dates? Not on our tours! All of our guides are originally from the UK and US, now living long-term in Buenos Aires, and are selected for their personality and local knowledge. So we really engage in communicating with you (not talking AT you), acting as your cultural bridge to understanding a foreign land and weaving a story that brings the fascinating history & culture of Buenos Aires to life. Don’t take a risk on any fly-by-night operation that has just stuck up a tourism website and worries what to do if they actually get some customers. And avoid those tour companies that try to be/sell all things to all people – they’re probably making it up as they go along. Come to the specialists – we’ve been giving ONLY private walking tours of Buenos Aires for over 11 years, and we just keep getting better at it. We have award-winning and industry respected tours, and are so confident that you’ll like them, we offer a 100% money back guarantee (see here for details, under refunds policy) to anyone not satisfied with their tours. No one has taken us up on it yet! And that’s because we just love to impress our customers. 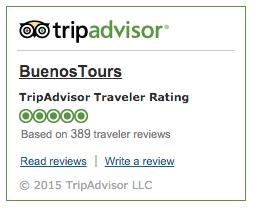 And it shows: our customers LOVE us and our tours – just check out their testimonials for proof, and the fact that we are TripAdvisor’s number-1-ranked private tour company in Buenos Aires!